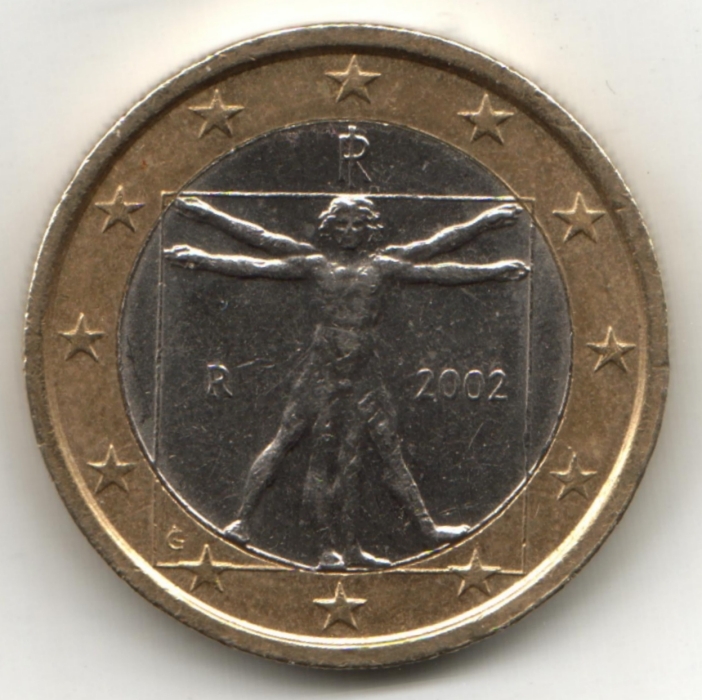 The Italian one euro coin, based on Leonardo da Vinci’s sketch of ‘Vitruvian Man’. The sketch shows the proportions of the human body according to Vitruvius’s De Architectura (fl. 1st century BCE), and it is a physical expression of Yeats’s integrated ideal, ‘that Unity of Being compared by Dante in the Convito to that of "a perfectly proportioned human body" ’ (A Vision B 82). In his chapter ‘Of the Proportion, Measure and Harmony of Man’s Body’, H. C. Agrippa adapts the concept to planetary and zodiacal schemes, further on in this page. For more on the drawing, see the Gallerie dell’Accademia, Venice; the notebook is not normally on display. The constitution of the human being, that Yeats outlines in A Vision, is a complex intersection of a number of different elements. It is an esoteric system, based upon the idea of different levels or planes of being, which interact with each other to a greater or lesser extent. Fundamental to the picture is the doctrine of reincarnation, so that certain core elements are retained from one life to the next, while others are shed at death or during the period between lives. In essence, there are three constituents that need to be taken into account: the four Faculties, the four Principles, and the Daimon. The Faculties form the substructure of the personality, the bias of the soul in action. The Principles are the inner spiritual part of the human being, which direct the person’s spiritual development over many lives and which shape the Faculties in each individual incarnation. The Daimon is slightly different: it can be seen as our self, reimagined as our opposite. In other words, it comprises the same Faculties and Principles but with an opposite emphasis, so that what is unconscious in our being is conscious in the Daimon’s and vice versa. Sometimes Yeats seems to treat the Daimon as a separate being, and he probably remained uncertain about its nature until the end. In a draft, Yeats wrote that: ‘Though for the purposes of exposition we shall separate daimon & man & give to man a different symbol, they are one continuous consciousness perception’. The change of ‘consciousness’ to ‘perception’ shows that even here Yeats remained unsure about whether the human and the Daimon are the same or different beings and so settled on a wording that was non-committal. It is dangerous to try to find ‘equivalents’ between Yeats’s System and other similar systems, because the equivalences are very inexact and, if we try to fit Yeats’s categories into those of another one, it can distort our understanding of Yeats’s elements. The closest equivalents are in the analysis of the ‘spiritual’ being, with the four Principles showing some relationship to the anatomies Theosophy and traditional Indian philosophy. Some people have found parallels between the temperamental elements of the four Faculties and their possible dispositions and the psychological categories of C. G. Jung: these comparisons can be very fruitful, but are far from exact. The Yeatsian Daimon was a concept that he had formulated in Per Amica Silentia Lunae before any of the System of A Vision began to emerge. In its earlier forms, therefore, it is closer to its traditional antecedents, but as the System began to emerge and to become increasingly complex, the Daimon is moved slightly into the shadows, while remaining very important in Yeats’s conception. 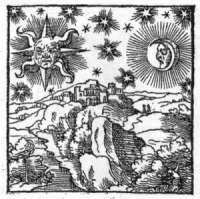 In traditional symbolism the Sun is usually identified with the spirit or self and the Moon with the soul or psyche, and in the Yeatses’ scheme the more spiritual elements of being are Solar and the more psychic elements are Lunar (see the Tinctures). If being is divided into two, we have the spirit in the Solar Principles and the psyche in the Lunar Faculties. Each of these 'halves', however, can then be divided into Solar and Lunar, so that there are Solar and Lunar versions of the Principles and Solar and Lunar versions of the Faculties: the Solar Principles represent the core that persists from life to life, and the Lunar Principles the spiritual qualities that change between lives; the Solar Faculties represent the objective elements of the psyche and the Lunar Faculties the subjective elements. The division is then taken one stage further into pairs so that we have the Four Principles and Faculties, with the more static half of the pair the Solar and the moving half of the pair the Lunar. Incarnate life is intrinsically Lunar, so that when it comes to the Daimon, the Daimon is Solar to our Lunar while we are incarnate. Since we humans keep descending again into Lunar incarnation, while the Daimonic part of our selves remains excarnate, this duality almost becomes absolute. However, in each of the pairs shown in the final row above, the human’s static or target Faculty (Solar) is the Daimon’s moving or appetent Faculty (Lunar) (e.g. human’s Mask is Daimon’s Will) and vice versa, so that each half of the human-Daimon continuum is simultaneously Solar and Lunar with respect to the other. Each of the Faculties can be expressed in a variety of ways along the spectrum of Solar-spiritual-objectivity and Lunar-psychic-subjectivity. However, the positions are strictly determined by an internal symmetry, and once we know the position of any one of the Faculties, we can assign the others immediately. In practice, the Will, the most Lunar of the Faculties, is the one that is referred to, so that when Yeats writes of a person as being in Phase 6, this refers to the position of their Will. Go to the page on the Faculties for further details. In the Lunar dimension of the Faculties, Solar and Lunar are given special names, the two Tinctures, which are the Solar primary and the Lunar antithetical. 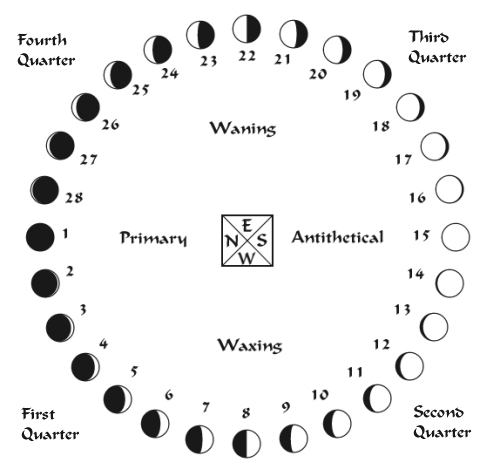 Each of the Phases represents a different propoportion of the Solar (primary)and Lunar (antithetical) Tinctures. A person’s Phase is the Phase of their Will, the most Lunar of all the elements in the being’s make-up. Click on any of the Phases in the diagram to show a window with the attributes associated with the Will of that Phase. If this map is not working, click here for an alternative diagram. The Faculties do not form the more superficial, individual layers of personality or character, since the Yeatses were strong believers in astrology and saw the horoscope as providing the outward personality. The Faculties are rather more subterranean, informing the underlying psyche and the bias of the soul’s quest in life. The Faculties dominate during our life in the body, directing action, while the Principles are present but usually submerged in the unconscious, emerging for most people only in dreams. The human being can be compared to an island of which the Faculties are the visible part that rises from the waves and the Principles are the unseen base that lies beneath the sea. At death the island disappears, returning to the waves, and during the after-life two of the Principles are also removed, so that only the core remains. This core of being is made of a dual Solar essence, Spirit and Celestial Body, the active part and the static part respectively. Once incarnations are finished, these will give way to what is called the Ghostly Self, but as long as we are in incarnation — and Yeats envisages a long, cyclical process — the starting-point of being is this Solar pair. Beyond the mid-point of the after-life period, the process of (re-)construction of the human being begins. The first stage is the (re-)formation of the absent Principles, the Passionate Body and then the Husk, which underlies the physical being, which form the Lunar pair of Principles. Husk is reflected as Will. Yeats writes that the ‘Principles are the Faculties transferred, as it were, from a concave to a convex mirror, or vice versa’ (AV B 187), and the analogy is exact, since a convex mirror spreads the reflected image while a concave mirror focuses and reverses it: generally the Faculties are more distinct, more separated from each other than the Principles and, though there is far less of a hierarchy among the Faculties, the ordering of the Principles reverses that of the corresponding Faculties. Will is the most important of the Faculties, and is essentially the will to live, while Spirit is the most important of the Principles, and is essential spiritual comprehension. Celestial Body which is at the top of the hierarchy of the Principles is reflected as Body of Fate, the least malleable of the Faculties, while Husk, at the bottom of the hierarchy of the Principles is reflected as Will, the most urgent of the Faculties which determines a person’s Phase. Within the System the goal of life is to attain as complete an experience of what is available as possible (see Central Propositions below). During the after-life the soul should then explore the experience gained to the maximum, seeking out causes, re-imagining motives and actions and seeking to exhaust all the material offered by this life. In a given incarnation the nature of the goal in life is determined first and foremost by whether it falls in the objective or subjective part of the cycle. The position of the Will determines whether a soul is in an antithetical (subjective, Lunar) or a primary (objective, Solar) incarnation, and the soul’s ‘true’ path is different in these two halves of the Wheel. In an antithetical phase the being seeks by the help of the Creative Mind to deliver the Mask from Body of Fate. In a primary phase the being seeks by help of the Body of Fate to deliver the Creative Mind from the Mask. a primary incarnation is to liberate the Creative Mind, its sense of universal values and apprehension of objective truth, from the self-made ideals of the Mask, through the help of external reality in the form of the Body of Fate. In short, to ‘get real’. an antithetical incarnation is to liberate the Mask, the self-made ideal values and sense of inner truth, from the claims of the mundane and oppressive Body of Fate, by the help of the Creative Mind’s sense of the universal and its realism. In short, to ‘follow its dream’. Neither of these options is more valid than the other, but if the being tries to get real in an antithetical Phase or to follow its dream in a primary Phase, Yeats’s System sees this as being ‘out of phase’, and doomed to frustration and disappointment, see True and False Faculties. Since the progress around the Wheel of Incarnations is more or less predetermined, and we should expect to go round the Wheel a dozen times, we will all sooner or later have gone through many variations of both of these movements. This fundamental split emphasises why the two transitional Phases, 8 and 22, are so difficult: firstly, neither Tincture is predominant and so the being’s aim is far less clear and, secondly, having gone through a series of incarnations where the aim has been the same the soul is being forced to shift its emphasis radically. The nature of the perfections in general is never really explored, nor their spiritual or psychic benefits, in keeping with Yeats’s avoidance of teleology or advice about the ethical implications of the System for human behaviour. Unity of Being receives considerable attention but little analysis and Sanctity is treated scantly under the description of Phase 27. Self-sacrifice is not explained to except to say that “it will be obvious for instance that self-sacrifice must be the typical virtue of phases where instinct or race is predominant, and especially in those three phases that come before reflection” (AV B 95), while the “Self-knowledge” attainable at Phase 13 is described as “a possible complete intellectual unity, Unity of Being apprehended through the images of the mind” and the possibility of bringing to the level of “perfection that in the antithetical life which corresponds to sanctity in the primary: not self-denial but expression for expression’s sake” ( 130). See further consideration of the Faculties, the Principles, the Daimon, True and False Faculties. ‘Of the Proportion, Measure and Harmony of Man’s Body’. All things are subject to a cycle of changes, which can be regarded as bi-polar, passing from a state of objectivity to one of subjectivity before returning to objectivity again. This can be seen as a form of oscillation, or a circuit around a wheel, and divides experience into the two halves of objectivity and subjectivity. Under the term objective can be taken all that is collective, unifying, and which involves the individual being absorbed in something greater than itself, be that nature, society, God. Under the term subjective can be taken all that is individualising, separating, pluralist and which involves the individual being differentiated as itself. Between the two poles, there are stages which represent varying proportions of objectivity and subjectivity, and directions of movement towards either objectivity or subjectivity. Human life falls between the poles, since the extreme states are abstract. The System is fundamentally humanistic and amoral. It deals almost exclusively with human experience and the human condition. The divine features, but is marginalised and seen as relevant only to part of the objective half of the Wheel. The individual soul is the focus, but more in terms of earthly experience and the series of reincarnations, which are the basis of the System, than in terms of spirituality. The spiritual is largely the province of the after-life. Human life is intrinsically subjective, the after-life intrinsically objective. However, the soul passes through a series of objective lives, then a series of subjective lives, then again objective and so on. Within the System completeness of experience is seen as the goal and the fortune of a subsequent life is determined by having exhausted experience in a given incarnation and the after-life that follows it, rather than by good or evil deeds. The order of incarnations is largely immutable, with the nature of contiguous incarnations changing gradually; there may be repetitions, because of incompleteness, and small jumps, if a life has been lived and understood very fully. In a given incarnation the nature of the goal in life is determined first and foremost by whether it falls in the objective or subjective part of the cycle. If it is objective, then the purpose is to recognise reality and to conform with the external world. If it is subjective, then the purpose is to sustain the inner dream and to follow it regardless of external pressure. All humanity must pass through the same Phases, if you are in an objective incarnation you have been and will be in subjective ones at the appropriate stage, and vice versa. Therefore individual self-expression is important, but so is tolerance and allowing others to fulfil their own expression. Imposing what is right for you on others is tyranny, and imposing the values of others or of previous lives will lead to failure: if objective principles are retained during subjective lives then the life will not be lived adequately, and vice versa. The role of the after-life is to reach an understanding of the previous incarnate life, to absorb the understood experience on a spiritual level, and then to prepare for the following life. The world goes through cycles as well as the individual soul. There are several cycles of varying length in operation at any one time. The current stage of the world is objective on several levels, so that the subjective is marginalised. However, there will shortly be a reversal, so that one of the major cycles will move into a subjective stage. This will enable the subjective to regain some prominence. For further exploration of these themes, see the essay "The Is and the Ought, the Knower and the Known: An Analysis of the Four Faculties in Yeats's System," by Rory Ryan in the collection W. B. Yeats's "A Vision": Explications and Contexts, edited by Neil Mann, Matthew Gibson, and Claire Nally (Clemson University, 2012).